It's nowhere near being a full Ultra-Harmonizer, but H3000 Factory does what it sets out to do very well indeed. Intuitive patching system Includes many H3000 features. Some great special effects patches. Low CPU hit. Limited algorithms. No MIDI-Controlled Effect for Logic. Sidechain options are DAW-dependent. 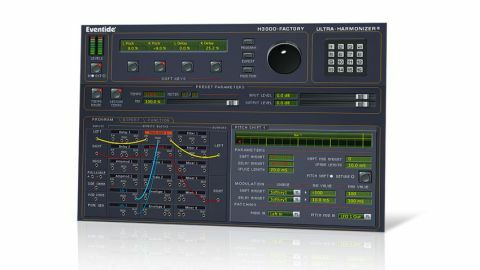 Eventide's H3000 Ultra-Harmonizer is one of the greatest hardware multi-effects units of all time. Some years ago, the company ported a few H3000 elements to TDM format, including the H3000 Band Delays and H3000 Factory, the latter of which is now available in native form (in AAX/AU formats for Mac and AAX/VST for PC). "This isn't a full H3000 emulation. However, it does include the flexible Patch Factory and Mod Factory algorithms." Just to be clear, this isn't a full H3000 emulation (the hardware ultimately included over 20 algorithms). However, it does include the flexible Patch Factory and Mod Factory algorithms. Processing options include two each of Delay, Pitch Shift, Filter, Amplifier Mod, Scale, LFO and Envelope, plus four Mixers. That's 18 modules, their incoming and outgoing audio signals routed using the colour-coded patch cords or the Program parameters. For visual clarity, modules can be rearranged, and most can be modulated using patch leads or via the Program or Function page parameters. Further options include a Noise Generator, the Function Generator (an enhanced LFO) and an external sidechain input (AU/AAX only). There are also four Soft Keys for quick control of multiple parameters via the large Mod Knob. "Programming an H3000 from scratch isn't for the faint-hearted, so it's good to see that plenty of presets are included (we counted 464)"
Programming an H3000 from scratch isn't for the faint-hearted, so it's good to see that plenty of presets are included (we counted 464), the highlights being a collection of patches from the likes of Dave Darlington and Richard Devine. Paging through the presets gives not only a general sense of what it is that the H3000 Factory delivers (delays, filters, modulation and pitchshifters), but also what it doesn't (no true flangers, phasers, reverbs, etc). There are quite a few replica patches from the hardware, but many of the classic algorithms aren't here (Reverb Factory, Reverse Shift, and Layered Shift, for example). So, that means no 'Voc Doubler BC', 'Dual H910s', 'Watery Chorus', 'Big Snare' or 'Crystal Echoes', to name but a few sought-after sounds. However, all is not lost, as some have been recreated using the multi-faceted Factory algorithms, and you'll find a good vocal doubler ('Tight Dual Shift'), widener ('Phantom Double') and a recreation of the original 'MicroPitchShift'. There's also a ton of special effect patches ('Alert', 'Jet', 'Laser Echo', 'Sub Rumble Generator', etc) utilising the triggered LFOs and Mod Knob, and plenty of sound mangling and filtering ('Aliens', 'MC Weird Phase', 'Son Of Kamikaze'). "The patch lead system might look like a gimmick, but it really comes into its own when you're modifying the preset patches"
We find that the H3000 Factory is best used for panned effects and delays, from the quite basic 'Scaled Pan Delay' to the busier 'Filter Delays' and on to some crazy ones like 'Lost In Space' and 'MC Filtered Echoes'. Using these as starting points, great fun can be had, and the patch lead system, which might look like a gimmick, really comes into its own when you're modifying the preset patches. Also worthy of note is that pretty complex patches can be put together with a pretty low CPU hit. It's certainly disappointing that Eventide were unable to include a greater range of algorithms from the original hardware, to allow genuine replicas of many more of the classic H3000 patches. What is here, however, sounds stunning, and with such a strong preset library behind it, the H3000 Factory just about manages to vindicate its pricetag.